The new millennium is the ‘Genomics Millennium’. Rapid advances and the wealth of information related to the science of genetics and genomics have wide-ranging applications in all aspects of human health. The philosophy of the practice of medicine is changing as society is acknowledging the impact of the completion of the Human Genome Project and affordable prospects of the clinical genome sequencing. Expectations of the public, media and politicians are exceeding all limits. Human health is now intricately linked to genes, genetics and genomics. In recent years, a new aspect of clinical medicine has emerged with emphasis on the medical and health implications of genomics. This is appropriately named ‘genomic medicine’ and holds great promise for human health. This new approach to health care uses the knowledge of an individual’s genomic make-up to identify those that are at a higher risk of developing certain diseases, and to intervene at an earlier stage to prevent these diseases. In addition, the genomic variation and specific genomic characteristics will enable researchers to develop tools to detect toxins, nutrients, microbes and other environmental agents that could have negative or positive implications for individual or community health. This would also enable developments of new drugs, better treatments and cures. The major role of genomic medicine lies in ‘prediction’ and developing strategies for holistic health care of an individual, often referred to as ‘personalized medicine’. The whole field is exciting and has attracted the interest of several institutions, pharmaceutical organizations, and investigators. The output from this tremendous research effort is currently channeled through existing genetics journals with only peripheral coverage of genomic medicine. There is a clear need and scope for a new journal to fill this gap. The Genomic Medicine Foundation (UK) plans to launch a new flagship journal to focus on genetic and genomic aspects of modern and future clinical medicine and health. This is appropriately named ‘Current Trends in Genomic Medicine’. 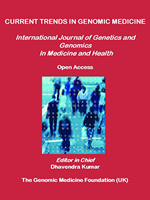 The ‘Current Trends in Genomic Medicine’, here in after referred as ‘CurrTrendGenomicMed’ is a new international journal aimed at providing and communicating advances in knowledge and new developments in the field of the science of genetics and genomics as applied to clinical medicine and public health. It will include major issues in the fast developing practice of medical and clinical genomics, drug discovery and development, and other related scientific developments relevant to promoting human health and prevention of disease. Emphasis will also be on social, ethical, moral and legal matters as applied to genomics and human health. A separate section will cover public interests, including media coverage of key and controversial topics related to public health and government policies on genomics based health service. The main aim of ‘CurrTrendGenomicMed’ is to provide an excellent resource for the publication of peer-reviewed original research papers, review articles and commentaries on a wide range of genomics related areas with demonstrable impact and/or likely implications for the current and future practice of clinical medicine, preventive medicine and public health. Advances in knowledge and developments in a number of genomic-related fields that are shown to/likely to have implications for clinical and preventive medicine. Examples of these fields include developmental biology, molecular biology, metabolomics, epigenomics, clinical proteomics, microbial genomics, comparative genomics, high-throughput genomic technologies (microarrays and next generation sequencing), bioinformatics, pharmacogenomics, nutrigenomics, toxicogenomics, personalized & stratified medicine, cancer genomics, population genomics, and stem cell genomics. Applications of genomics in understanding the complex medical diseases (coronary artery disease, diabetes mellitus, bronchial asthma etc. ), common cancers, skin diseases, and psychiatric diseases. For example, genome wide studies using single nucleotide polymorphisms (SNPs) and sequence variations. Applications of genomics in infectious diseases, for example susceptibility, protection, antimicrobial therapy and development of vaccines. Genomics-based development and evaluation of new drugs including adverse or favorable response to pharmacological and toxic substances. Impact of medical genomics on public and population health. Integration of genomics in medical and health education. Debate and discussion on social, legal, moral and ethical issues related to medical genomics. Grand round discussions of clinical cases supported by genomics-related diagnostic and therapeutic applications. Reporting and discussion of books, conferences and reports on contentious issues in human and medical genomics. The journal is aimed at practicing physicians and clinical scientists from a broad range of medical and surgical specialties, including community and public health. This would provide an excellent resource for publication and discussion from a wide range of physicians, clinical scientists, research and academic professionals, and genetic professionals engaged in original and applied research in human or medical genomics. Other possible readers and subscribers could include scientists and academic professionals working in related areas such as developmental biology, molecular biology, pharmacogenomics, microbial genomics, clinical teratology/ toxicogenomics and nutrigenomics. ‘CurrTrendGenomicMed’ is an on-line open access journal. All accepted articles and submitted manuscripts shall be published soon after acceptance. All material will be put together in quarterly issues. Review article – on a selected topic of wide interest, this will be invited or commissioned to a voluntary author or an institution. Original papers – based on ethically approved and peer-reviewed research work supported by relevant experimental work and statistical data. Short reports – on clinically relevant research in any of the genomics-related fields. Grand round – proceedings of clinical or clinic-pathologic meetings in any major hospital or medical institution highlighting the use of genomics- based diagnostic and/or therapeutic techniques. Media mirror to provide unbiased coverage on developments in genetics or genomics including news items appearing in the press, Internet, radio and television. Genomics News – Editorial comments on recent publications in other related journals. Books received and Reviews – commissioned by one of the editors on books sent by publishers. General information about editorial matters, subscriptions and instructions to authors. Name of any other journal(s) where the paper is under consideration for publication. Evidence that the manuscript is approved for publication by all co-authors. Validation and permission from the responsible authorities at the Institution where the work was carried out. Statement on ‘conflict of interest’ by all co-authors or the Institution. Copyright transfer statement duly signed by all authors or contributors. Manuscripts should be submitted online using editorial manager as per onscreen instructions. Manuscripts may also be submitted on a 3.5” floppy disc or CD written and compiled in any of the commonly used format, for example Microsoft Word document, RTF, PDF etc. The electronic version of the manuscript should be supported by a hard copy for validation. Electronic submissions of manuscripts are preferred. Manuscripts should be submitted online using editorial manager by following the onscreen instructions. Attach all documents as IBM-compatible (e.g. Word 5, Word 7, PowerPoint) files. Send two hard copies of the manuscript along with figures/tables and an IBM-compatible floppy disk by regular post. Return e-mail address and full postal address, a telephone number and fax number should be provided with all e-mail submissions. The submission requirements of CurrTrendGenomicMed conform to those presented by the International Committee of Medical Journal Editors in “Uniform Requirements for Manuscripts Submitted to Biomedical Journals” and the “Declaration of Helsinki: Recommendations Guiding Physicians in Biomedical Research Involving Human Subjects” (JAMA 1997; 277:927-934). The complete text of these guidelines appears in Annals of Internal Medicine 1997; 126:36-47, or New England Journal of Medicine 1997; 336:309-315. Full title of the paper/article. Category of manuscript being submitted, for example original article, letter to the editor etc. Mailing address, a telephone number and fax numbers, and e-mail address of the corresponding author. Confirmation of ethical approval, if appropriate, from a relevant regulating body or an official ethical committee. The covering letter should also include author(s)’ justification as to why the paper is particularly suited for publication in ‘CurrTrendGenomicMed’. The first page of the manuscript should contain on separate lines, the full title of the article, authors’ names and institutions. If the title exceeds 40 letters and spaces, a short title, not exceeding that limit, will be required to be used as a running head. The first page should also include the full mailing address, e-mail address (if available), and telephone and fax numbers of the author to whom all communications and proofs should be sent. Papers and articles must be clearly divided into the following sections: Abstract (not exceeding 200 words); Key words; Introduction; Materials and Methods; Results; Discussion; Acknowledgements; References; Legends; and Figures/Tables. Editors are aware that this format may not be applicable for review articles, news/commentaries, and letters to editor and brief communications. Four to nine key words for indexing purpose should be given. These should be arranged in alphabetical order and, when possible, adjusted to the Medical Subject Headings of PubMed, Index Medicus, Current Contents. Google Scholar etc. References should be numbered consecutively in the order in which they appear in the text. References should be identified in the text, tables and figures by Arabic numerals and appearing in square brackets. In case of consecutive references, numbers can be used with a hyphen, for example [1-5]. Papers or articles accepted for publication may be included with abbreviated title of the article, name of journal followed by (in press). All papers and articles not yet accepted can be included as (submitted). The author(s) against the original documents should verify the references. Title of journal articles should be abbreviated in accordance with the style used in Index Medicus/ MEDLINE/ Current contents, Google Scholar etc. Seyda A, Newbold RF, Hudson TJ, Verner A et al. A novel syndrome affecting multiple mitochondrial functions, located by microcell-mediated transfer to chromosome 2p14-2p13. Am J Hum Genet 2001; 68:386-396. Hayden MR. Huntington’s disease. In: Pulst S-M eds. Neurogenetics. Oxford University Press, 2000. The journal will include acknowledgements on those directly involved in the study but not included as co-authors. Sources of financial support and industrial affiliations of those involved should also be included. Legends should be typed on a separate page and attached at the end of the paper. All illustrations, graphs, drawings, or photographs are referred to as figures (abbreviate as Fig./Figs.). These should be numbered in sequence with Arabic numerals. Each figure should be identified with a figure number on the back. Any line drawings that are to appear in the illustrations should be large enough for the necessary reduction. In general, photographs should be one and a half times larger than the block and must be submitted as mounted glossy enlargements showing good detail with adequate contrast. Colour illustrations may be published at the editor’s discretion. There may be an additional charge for color illustrations, which will be quoted by the publisher. Submit original color prints. The tables should be typed on separate pages. These should be numbered consecutively with Arabic numerals. A circled marginal note should indicate the approximate location of the table. All abbreviations and symbols should follow generally accepted standardized terms. Unfamiliar abbreviations should be defined when first used in the text. For further details, see Units, Symbols, and Abbreviations: A Guide for Medical and Scientific Editors and Authors. (Available from The Royal Society of Medicine Press, 1 Wimpole Street, London, W1M 8AE, England). 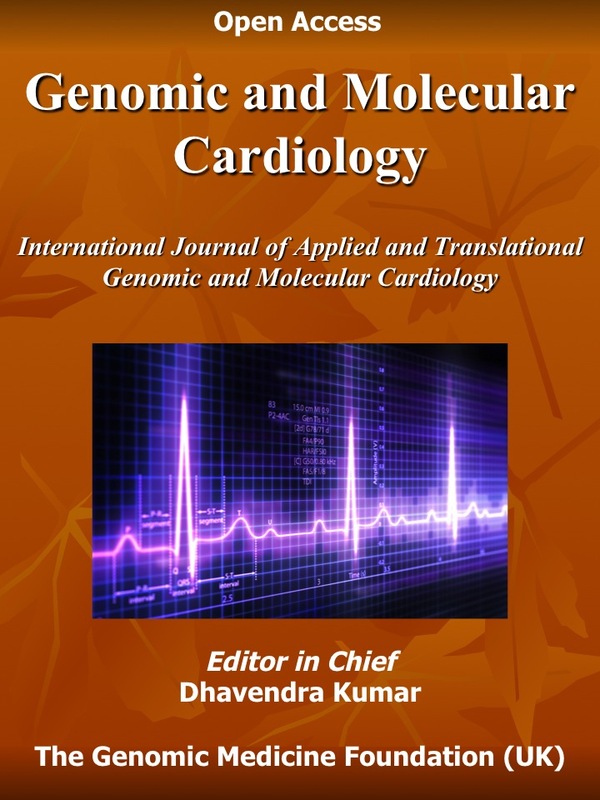 ‘CurrTrendGenomicMed’ is an online/ open access journal; ‘received’ date indicates the date of receipt of the first version; ‘accepted’ indicates date of acceptance of the final version. Authors and contributors submit their paper on the clear understanding that the work has not been previously published, or submitted elsewhere for publication. All authors and contributors are expected to have read and approved the final version before its submission to ‘CurrTrendGenomicMed’. The submission of the manuscript by the authors means that the authors agree to assign exclusive copyright to the publisher, The Genomic Medicine Foundation, UK Ltd. (www.genomicmedicine.org ), if and when the manuscript is accepted for publication. On acceptance, the corresponding author will be sent a Copyright Assignment form returned duly signed by all the co-authors. The work shall not be published elsewhere in any language or in any format without the written permission of the publishers. No material published in the journal can be reproduced in any form or stored on microfilm or videocassette or in electronic databases and the like.